U.S. Leadership Falls Further Behind China In Global Regard, Gallup Poll Finds The U.S. maintained a strong lead in the annual poll for years until 2017, when its worldwide approval rating plummeted to 30 percent. That number increased slightly in 2018. 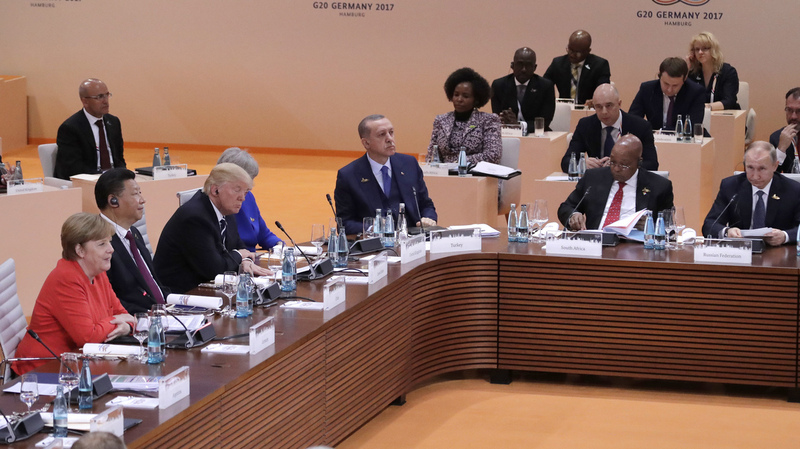 A new Gallup poll finds global regard for U.S. leadership rose slightly in 2018, after a dramatic drop in 2017. China and Russia also saw their leadership approval ratings tick up. Germany's approval rating fell to 39 percent. Worldwide approval of U.S. leadership remains low but relatively stable after a dramatic drop during President Trump's first year in office, while China's rating ticked up to its highest in almost a decade, according to a Gallup poll released Thursday. The report, which measures how adults in 133 countries feel about the global leadership of the U.S., China, Germany and Russia, shows that U.S. leadership earned a median 31 percent approval rating in 2018, a slight uptick from 30 percent the year before. Positive international perception of both Chinese and Russian leadership continues to strengthen, according to the report, while Germany, which leads in the rankings, fell just below a 40 percent approval rating for the first time in more than a decade. The low approval rating for the U.S. "suggests that the doubts sowed in Trump's first year about U.S. commitments abroad have taken root," the Gallup report reads. "In this climate, China's leadership has gained a larger advantage in the 'great power competition,' and the other player, Russia, is now on a more even level with the U.S."
For much of the past decade, the U.S. maintained a lead of more than 10 percentage points over China and Russia in the polls, competing with Germany for the spot of the most well-regarded global leader. That changed in 2017, when the U.S. saw its image abroad fall sharply in the poll. In the most recent report, the U.S. remained neck and neck with China and Russia. China's approval rating jumped up to 34 percent, while Russia continued its steady upward trend of the past few years and reached its highest rating since 2008, hovering just below the U.S. at 30 percent. Russian approval of U.S. leadership also continued to increase, with 11 percent of Russians surveyed now saying the U.S. is doing a good job as a global leader. That marks a significant improvement from 2015, when only 1 percent of Russians approved of the country's leadership under President Barack Obama. Still, it's one of the lowest opinions of the U.S., with only Yemen (9 percent), Iran (8 percent) and the Palestinian territories (7 percent) giving the U.S. a lower grade. The perception of U.S. leadership abroad helps determine how much the U.S. can exercise its influence through "soft power," writes Jon Clifton, a global managing partner for Gallup. "Where hard power is reflected in America's ability to impose its economic and military might on others, soft power is the type that makes people in other countries want to align their interests with the U.S.," Clifton writes. "Not because they have to, but because they want to."